This is the eBook of the printed book and may not include any media, website access codes, or print supplements that may come packaged with the bound book. 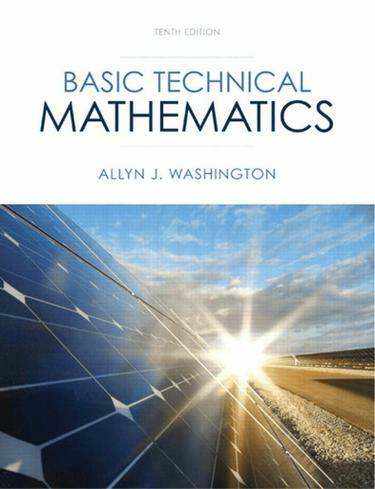 This tried-and-true text from Allyn Washington preserves the author's highly regarded approach to technical math, while enhancing the integration of technology. Appropriate for a two- to three- semester course, BASIC TECHNICAL MATHEMATICS WITH CALCULUS shows how algebra, trigonometry, and basic calculus are used on the job. It addresses a vast number of technical and pre-engineering fields, including computer design, electronics, solar energy, lasers fiber optics, and the environment. Known for its exceptional problem sets and applied material, the book offers practice exercises, writing exercises, word problems, and practice tests. This edition features more technical applications, over 2300 new exercises, and additional graphing calculator screens.